A freshman at Farmersville High School is making her mark on the world by singing notes of victory and support for those struggling with epilepsy. Casey Chambers, 15, was diagnosed with epilepsy last year causing her world to change in many ways. The teen was at a cross-country meet when she had a seizure for the first time and her friends thought she was just messing around. After being diagnosed in February 2018, Casey was no longer allowed to have the freedom she was accustomed to having. Her life focused on anti-seizure medicine that must be taken daily at the exact the same time and her family began to hover over her. She could no longer swim by herself, go for her daily runs alone, and close family and friends must have her ‘rescue medicine’ with them in case she has a severe seizure. “Anyone that is around her for any length of time gets the ‘talk,’ and for kids that pressure can be overwhelming,” her mom, Tracey Chambers said. Though her medicine is vitally important, her mom said it also has extreme side effects such as anxiety and sadness. Complicating matters even further, Casey’s friends became distant and the teen felt isolated dealing with her illness. Instead of feeling defeated, the 15-year-old decided cope with her emotions by focusing on music and writing original songs which helped lift her spirits and give her hope. “Within 10 days of picking up the ukulele, Casey was able to play complete songs. “It was amazing to watch her develop a talent almost instantly,” her mom said. Wanting to cheer up her daughter at this difficult time, Tracey entered Casey’s song “Good for You” in the Rodeo Rockstar competition at the Houston Livestock Show. “I did it without her knowledge, so she was a little mad at me,” Tracey said. Casey’s song made it past the junior division preliminaries. The top 10 winners will be invited to sing on a stage at the Houston Stock Show and the top five get to sing on the rodeo’s main stage. “It’s a lot of pressure but I’m excited to sing in front of a live audience if I get that far,” Casey said. The winner will receive a cash prize and three to four professionally recorded songs. “This is what I want to do with my life, so the professionally recorded songs would definitely give me a leg up,” Casey said. Casey wants to use her songs to educate people about epilepsy and to let those going through difficult circumstances that they aren’t alone. The song, which is inspired her real-life experiences, speaks of someone being a bit ‘salty’ about friends abandoning one another and relationships changing. Aside from singing, the teen stays busy. Running also helps her focus and she enjoys having some freedom to run on her own. Though she isn’t sure if she will compete in cross country this year, she lettered in the sport as a freshman and also participates in Color Guard, One Act Play, and she plays tuba in marching band. “I will walk while she runs, and we are hoping to get her an Apple Watch which has the technology to detect large seizures,” Tracey said. Like most 15-year-olds, Casey is anxious to have the ability to drive. 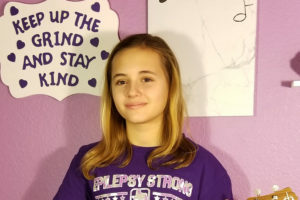 She recently received her learner’s permit after a weeklong video EEG brain wave study. At home, Casey has the support of both her mom, and her dad, David, along with six brothers – Ryan, Zachary, Christian, James, Cooper and Travis, her sister-in-law, Amanda Chambers, and her cat. Voting for Casey’s song in the Rodeo Rockstar competition online until Feb. 5. To vote for Casey’s song, individuals must have a Facebook account and the link can be found on Tracey Chambers’ account. To vote, select the junior division and Casey is the first entry. Votes can be cast every hour until the deadline.